Zoë appeared alongside David Hasselhoff on spoof chat show The Kumars at No. 42. Sanjeev Kumar (played by Sanjeev Bhaskar), is an aspiring, rather narcissistic television presenter, who acts as host to the celebrity guests invited to his home in suburbia, while his eccentric family undermine his efforts as interviewer. Sanjeev's mother, Madhuri (played by Indira Joshi), father Ashwin (Vincent Ebrahim) and grandmother Sushil (Meera Syal) can always be relied upon to embarrass him! In this episode, Sanjeev and Sushil suspect that Ashwin is having an affair. Ashwin Kumar: [Opening the front door] Miss Zoë Wanamaker! Madhuri Kumar: Miss Wanamaker, I'm so excited to meet you! Zoe: Thank you very much! Madhuri: I'm Sanjeev's mother. Welcome! Sanjeev Kumar: I'm Sanjeev - star of the show! Zoe: Oh! How do you do? Sushil Kumar: Oh, darling! How wonderful to meet you! I am so honoured. You know, I love My Family. Sushil: I mean, your show, not this lot. They get on my nerves, and one of them smells. Sanjeev Kumar: Hello and welcome to my show. Now, my first guest is one of this country's finest actresses. I know that you'll 'wanna-make-her' very welcome, because it is Zoë Wanamaker! Madhuri Kumar: [To Zoë] There are samosas - I made them - and here's some chutney. Ashwin always likes a bit on the side. Ashwin Kumar: Ain't that the truth! Sanjeev: Now, Zoe, welcome to number forty-two. Zoe: Thank you very much. Sanjeev: Now, of course, everyone knows you from the sitcom My Family, which has been hugely successful. What was the most fun thing about doing that show? Zoe: Being asked, I think. Just working with everybody and getting to know all the other actors more and enjoying them more. Sushil Kumar: And having a regular income! Sushil: That's quite nice, isn't it? Madhuri: Zoë, in your show My Family, why do you give your husband such a hard time? He's a dentist - that's only one down from doctor. Zoe: Because he's not very bright, and he needs to be educated in the right way. Sanjeev: Are you saying that's why he's a dentist and not a doctor? Sushil: It could be worse. He could be doing endless retakes of Business Studies, which is what Sanjeev did. Sushil: Zoe, darling! You know, in India they tried to do a version of My Family, but it didn't work - two-hundred-and-fifty-seven main characters! That's a lot of names to remember, isn't it? Sanjeev: Talking of family, you're the daughter of a very famous man, referring of course to your father. He was a movie director called Sam, and he came... Well, I'm telling the story. Why am I telling it? Sushil: [To Sanjeev] You idiot. [To Zoe] The great Sam Wanamaker was one of the first Method actors, wasn't he, darling? Zoe: Yes, he was. That's right. Zoe: Yeah, I think you're slightly simplifying. I think Method acting is to... I don't know what it is. Sanjeev: [It] is to do a pooh, isn't it? Sanjeev: But that's what... Brando was a Method actor, wasn't he? Sanjeev: You could see it [impersonates Marlon Brando]: 'The horror, the horror!' But explain Method acting, then. What is it? Sanjeev: So between, sort of, like, you know, losing weight for a part and murder, where does doing a pooh come? Sanjeev: Nowhere? That's a fascinating area, it really is, actually. Now, your dad came to Britain from America where he was escaping the McCarthy 'witch-hunts'. Did he have any special powers [or] anything like that? Zoe: No, he didn't. No, none of those. Sanjeev: But it was an horrific time, was it not, that whole McCarthy time? Sushil: Yes, just like The Crucible, wasn't it? Sushil: [To Ashwin] Wrong Crucible. Sanjeev: Sorry, Zoë. Now, let's get back to your family - I mean your real family. You got married quite late in the day, didn't you? I don't mean, like, nine o'clock in the evening, but I mean relatively late [in life]. Zoe: Yes, I did. I didn't really believe in marriage very much, and then it just became the right time, and somebody really nice asked me. Sanjeev: So I assume, like me, you've played the field quite a bit! Zoe: I'm not telling you! Sushil: No, no, Sanjeev. You have only played in a field. That's a different thing. [To Zoë] He's never had a girlfriend. Sanjeev: No, no. What she means is I haven't met Miss Right. That's all she means. Sanjeev: A woman's gotta have something pretty special to tie me down. Sushil: Yes - muscular arms and industrial strength rope! Sanjeev: Yeah, all right, all right! Ashwin: [Looks at Madhuri] I met Miss Right forty-two years ago, and she's all I've ever needed. Ashwin: Miss Wanamaker, you managed to get a designer-label coat for absolutely nothing. That story appeals to every fibre in my body! Talk me through it, leaving out no detail. Zoe: And I said, 'Well, tell him to go away. I'm busy and I don't want to see him at all!' [Smiles] Anyway, he came in. I was talking to him about our producer, and I was saying to him, 'He's a really mean man!' And I said, 'For instance, he won't give me that coat' - and it was sitting on the back of the door - and he said, 'I think you should give it to her, don't you?' So that's how I got the coat. Ashwin: I wonder if this Mr Pacino would accompany me to B&Q [a DIY shop]. Tell him it's late openings on Wednesdays. Sushil: You know, I once got a free designer cardi from Cardi Corner in Brick Lane. It's a complete one-off, 150% nylon. It produces so much static it's actually illegal to wear it on a commercial airliner! Sanjeev: Actually, the [inaudible] Singh fashion emporium in Southall once gave me a tank top with leg holes. It's a one-piece thing. Madhuri: Zoe, you were in Harry Potter [and the Philosopher's Stone], weren't you? Madhuri: That must have been lovely. Zoe: Yes, it was. It was great fun. Sanjeev: But how did they do all the flying bits in it? Zoe: Basically, you have to sit on a bicycle seat and then get strapped into a safety harness. And then this machine, it had a broomstick on it, and so the computer knows exactly what moves it's going to do. So your broomstick can go down or it can go up or it can go sideways, but it's programmed in. The day I went on it, it broke down and it went down like this [leans forward sharply]! Then I had to go to the canteen and have something to eat while they fixed it, and then I had to go back in again. Sanjeev: Wow, what did you have to eat? Sanjeev: You see, I like those little bits of detail. I mean, obviously, Harry Potter's been very popular the whole world over, and I feel a great affinity with Harry Potter. Sanjeev: Yeah, because we were both born special, you know. I mean, he was born with wizard powers, and I was born with an extra large appendix. I can digest grass! Ashwin: It's true, Miss Wanamaker. Ashwin: Most kids, you have to twist their arm to [persuade them to] mow the lawn. But not Sanjeev. Sanjeev: It's true. It's delicious; it is lovely. Sushil: Zoe, darling, I want to talk to you about your extraordinary performance in Mother Courage, for which you won many awards. Now, [what is] even more extraordinary [is] that you didn't actually have any lines, did you, in that part? How did you do that? Zoe: It was great. It's best not to have any lines, and then also you die at the end and everybody feels very sorry for you, and I enjoyed that the best. That was good. Sanjeev: Zoe Wanamaker, let me ask you this: what is the difference between Mother Courage and Mother Goose? Zoe: I think one is by Brecht and the other one is a fairy story. Sanjeev: In Mother Courage do you throw sweets into the audience? Zoe:[/b] No, no, we didn't in that one. Sanjeev: OK, OK. You see, it's important for the kids watching at home. So, basically, less sweets get thrown into the audience during Brecht. That's the way to remember it, is it not? Which, I think, is the beauty, personally, of Brecht's work. Zoe: I think you're right! Madhuri: You were in Doctor Who, weren't you? Zoe: Yes. Yes, I was. Madhuri: Sanjeev has to watch Doctor Who from behind the sofa. Sushil: He watches everything from behind the sofa; that's where he hides his food. Sanjeev: [To Zoë] I've got a den back there. Sanjeev: Yeah, yeah, yeah. [Hides his mouth, pretending to peek out from behind the sofa.] Now, am I eating now or not? Zoe: No, you're not, you're not. Sanjeev: You see, that's the beauty of it. Zoe: What an actor you are! Zoe: It's amazing. I don't know why you don't work more! Sanjeev: [To Sushil] Ask a question. Sushil: I want to know, darling - because you're so beautiful and lithe - do you have an exercise regime? Zoe: I don't know about a regime, but I do do something called Pilates, which I've been doing for a very long time, about twenty-five years or so. And I do that a lot. Sanjeev: [To Zoë] Sorry, I do apologise. [To Sushil] You mean Pilates. Sushil: I know what I mean. Sanjeev: We're just coming to the end of this part of the interview, and I'd like to end the interview in the way that the great Bard, Shakespeare, would end many of his plays, by saying that's all we hath time for! 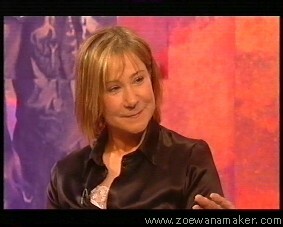 Ladies and gentlemen, Zoë Wanamaker! Ashwin: Come through. You were very good out there. Ashwin: Once we've cut out the crappy bits, it'll edit down quite nicely. Ashwin: [To his relatives] You three, come through to the lounge. You're being rude to Miss Wanamaker. I was just telling Zoe she should join me for a game of golf up in Northholt. Madhuri: Oh, yes. Ashwin adores his golf. You love playing a round, don't you? Ashwin: I can't deny it, Miss Wanamaker. Ashwin: Oh! That'll be Mr Hasselhoff! Sanjeev: Actually, you've won an award recently as well, haven't you, Zoe? Sanjeev: You won the... is it the Rose D'Or? Sanjeev: You won Best Actress in a Sitcom. Zoe: Yes, I did, yes. Sanjeev: What's that award like? Sanjeev: You must be so proud! Ashwin: Yes, that was an excellent show. Well done! You both certainly earned your strictly nominal fee!